Did you know that our PTA plans many of your child’s favorite events? The Fall Festival, Jaguar Jog, Arts & International Night, Jaguar Jump Into Summer, 5th grade events, and Spirit Nights wouldn’t be possible without our PTA! The PTA supports SES in so many other ways including awarding grants to teachers to purchase classroom resources, hosting staff appreciation events, and providing volunteer support (Room Parent, Media Center, Book Fair helpers, etc.). And, the PTA funded the new electronic marquee sign in front of the school, the STEM classroom, new Media Center tables and chairs, and fun playground equipment. It’s really amazing when you look at it all together! 5 minutes and $5.00 is all it takes to be a Suwanee PTA member. This year, our goal is 400 members. We already have 203, so we are well on our way! But more importantly, our focus this year is increasing parent engagement. It takes a lot of volunteers to run all of these awesome activities, so if you’ve wondered in the past how you can help—even just for a few hours a year—we need you! Click on the following link to sign up online. It’s so easy! http://bit.ly/SuwaneeElementaryPTAMembership If you’d prefer to sign up in person, we’ll have a table set up at Curriculum Night with membership forms and our cool new spiritwear! And don’t forget to sign up for PTA Remind 101 by texting @SUWANEEEL to 81010. Suwanee Elementary would not be the wonderful place it is without volunteers like you! We’re ready for a fantastic year! 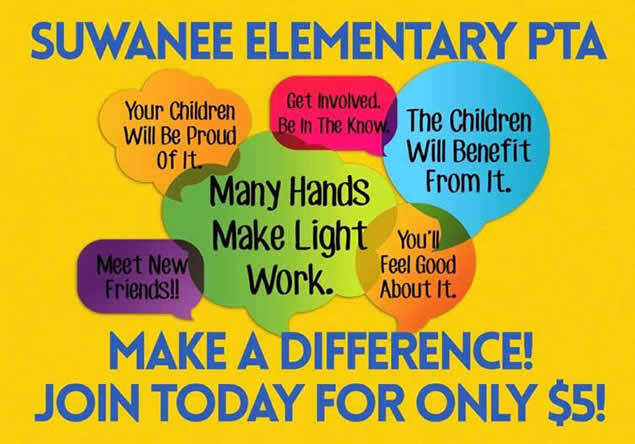 Be sure to like us on Facebook: Suwanee Elementary PTA for important updates and information. Questions? Email us at suwaneepta@gmail.com.